Lady Bunny at Wigstock 2018. Photo: Mark Tusk. 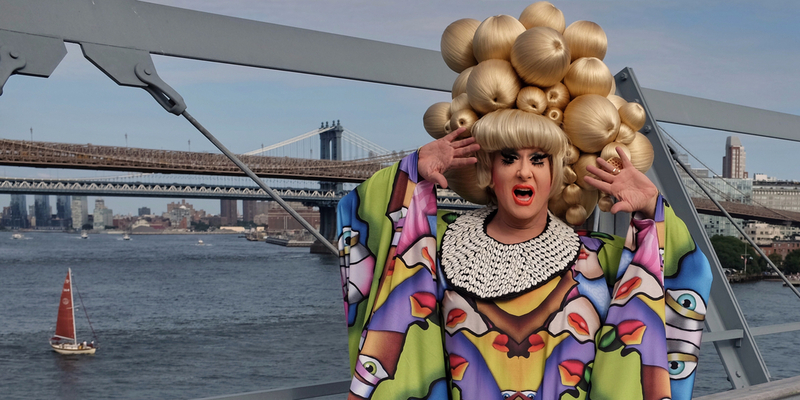 As always, the format was a marathon variety show hosted and curated by Wigstock’s figurehead, Lady Bunny, whose wigs for the event were practically as big as the Brooklyn Bridge, which was hovering in the background. Bunny is one of the world’s most famous drag artistes, and her connections run deep––the eclectic lineup featured up-and-coming queens (the youngest was pipsqueak social-media star Desmond Is Amazing, age eleven), boobtube stars from RuPaul’s Drag Race, and Wigstock veterans, including me. My first appearance goes way back to 1989. Also looming large was actor Neil Patrick Harris (no stranger to wigs himself, having starred in the title role of Hedwig and the Angry Inch on Broadway). 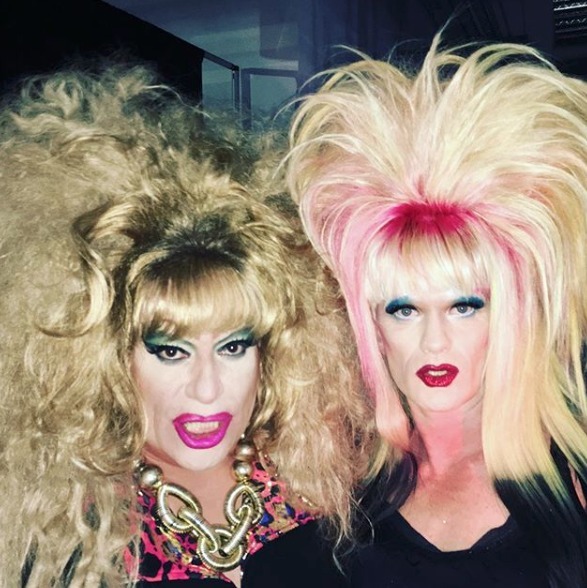 He and his husband, David Burtka, had urged Bunny to revive Wigstock, and it was largely due to their support and connections that the event was such a slick affair, including a concert-worthy stage with state-of-the-art lighting and jumbo screens to project performances. Left: Heklina and Neil Patrick Harris. Photo: Heklina. My comedy act was scheduled for the latter part of the show, and in order to stay focused, I tried to keep my socializing to a minimum. But who could resist gabbing with so many irresistible personalities? The world’s most famous transsexual, Amanda Lepore, who looks like a Marilyn Monroe blow-up doll, was charming as always. Professional gossip Michael Musto, in a blond fright wig, reminisced about the times he had done drag over the years. And Lypsinka, one of the grand dames of the drag world, was kind enough to let her makeup artist give me a touch up. My pre-stage jitters didn’t stop me from venturing upstairs to check out the show. Seeing drag performed not in a dark nightclub but under the shining sun is quite novel. (Thank Goddess, the weather was perfect.) It wasn’t even afternoon tea time, and there was Mona Foot soaring across the stage as Wonder Woman, losing her wig in the process; Darcelle XV, allegedly the world’s oldest drag queen at age eighty-six, warbling out a number; and Peppermint, a former Drag Race star now appearing on Broadway in Head over Heels (a musical which is set long ago in a magical kingdom), who time-traveled to more recent times with her tribute to Salt-N-Pepa’s 1993 hit “Shoop,” complete with a bevy of backup dancers. As my time to hit the stage got closer, I retired to a secluded part of the dressing room to rehearse my lines. From there it was on to the backstage, where I waited for my introduction. By then it was nighttime—a huge spotlight greeted me as I walked out. Of course, I started with a few zingers aimed at Bunny, and from there went on to joke about RuPaul’s singing ability, other Wigstock cast members, Caitlyn Jenner, and various other draggy topics. While it was all in good fun, somebody from the audience kept yelling, “Be nice.” Get a clue, honey! Who cares what he thought. I had the crowd roaring. Linda Simpson performing at Wigstock 2018. A few days later, I got together with Bunny for lunch to reminisce about the day—and to talk about the future of Wigstock. While she’s eager to keep the event going, Pier 17 may not be ideal because it’s vulnerable to bad weather. Soaking rain and synthetic hair are not a good combo! What she’s hoping for is a performance space in Manhattan that offers both an indoor and outdoor area. Anybody know of an appropriate venue? We gotta keep this drag party going!